We hope you enjoy this edition of the IS-BAO newsletter! It includes information about EASA Part NCC, ICAO’s encouragement to participate in IS-BAO, The Value of IS-BAO, new implementation tools for the Smart Operator, and more. The IS-BAO Team continues to work with IBAC Member Associations, operators, auditors, support services affiliates, and other stakeholders to bring harmony to the world of business aviation safety. We enjoy meeting you at our workshops and other venues and look forward to a productive and meaningful year serving the business aviation industry with passion. IBAC developed the EASA Part NCC Compliance Tool which satisfies IS-BAO 3.3, Compliance Monitoring System, and covers all the applicable EASA Part NCC Elements. IBAC also developed an EASA Part NCC Generic Operations Manual for operators who do not have a conforming manual. Did you know that the IS-BAO is recommended by ICAO? See the below excerpt from ICAO Global Aviation Safety Plan, page 35. Value #1: Leadership Opportunity IBAC encourages Stage 2 and Stage 3 operators to consider their leadership role in the industry and actively engage their applicable IBAC Member Association with ideas to ensure that the IS-BAO continues to serve the industry in the most progressive, yet practical and reasonable way. IBAC also strongly encourages these operators to serve as mentors for other operators starting their IS-BAO journey. Value #2: Insurance Incentives Insurance providers such as USAIG and Global continue to offer significant incentives to attain and maintain an IS-BAO registration. Click on the hyperlinks to learn more! Value #3 Promoting and Validating a Safety Culture Establishing and maintaining a generative organizational culture, or safety culture, is one of the essential requirements to achieve a Stage 3 IS-BAO Registration. Here’s the link to learn more about IS-BAO Stage 3 Cultural Attributes. It is only via a safety culture that an operator is really enabled to collect the critical low-consequence safety information (errors, deviations, near misses, and minor incidents) to prevent an accident or serious incident. Value #4 Community: Being part of a community of hundreds of other operators supports the mission of bringing harmony to business aviation around the globe. We are a family of professionals seeking the best possible ways to operate together with the common goals of safety, operational excellence, and efficiency. If you are still wondering about the value of IS-BAO, pick up the phone and call home (i.e. IBAC). Our team is operationally oriented with extensive experience in operations and maintenance and we want to understand your point of view. IBAC serves the community by representing your best interests (promoted through one of the 14 IBAC member associations) to the ICAO. Together, we can make a positive change to the world of aviation. Value #5: Benchmarking: The IS-BAO is respected around the globe. 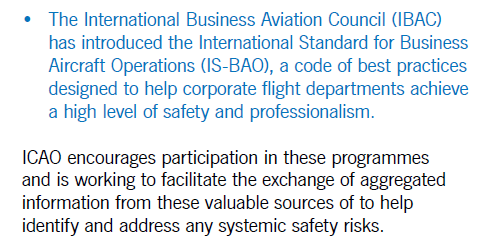 ICAO’s Global Aviation Safety Plan encourages the implementation of IS-BAO (p. 35) and IS-BAO is promoted by IBAC’s 14 Business Aviation Member Associations (NBAA, EBAA, BBGA, MEBAA, CBAA, AsBAA, ABAG, ABAA, GBAA, EBAA (France), RUBAA, JBAA, BAOA, IBAA). Furthermore, given the fact that the U.S. Federal Agencies have adopted the IS-BAO to validate operational excellence (FAA flight operations, NASA, FBI, DEA, DOE, NOAA, and more signing up this year!!) it is easy to see why an aviation organization would consider utilizing the IS-BAO to validate their safety efforts. All ERP standards and recommended practices in chapter 11 were relocated to the IS-BAO Implementation Guide. 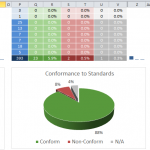 This was yet another significant step to reduce the total number of prescriptive versus performance-based standards. The ERP is still required in the SMS. What the operator decides to include in the SMS is up to them as long as it is tailored and suitable to their operation. Furthermore, operators should give due consideration to the information in the IS-BAO Implementation Guide. All standards and recommended practices related to fatigue management were moved to the new Chapter 11, Fatigue Management Program. Clarity was provided to ensure the AE is accountable for the SMS performance, while the SM and other managers are responsible for ensuring the SMS is functioning effectively on a day to day basis. 6.12.2 was modified to make clear that crew member shall utilize these checklists in the performance of their assigned duties using the methods required by the operator. Also, 6.12.3 was added to state, The operator shall ensure that flight crews comply with best practices for checklist execution. It’s not enough to say that the training provider will ensure proper checklist discipline. These organizations get a snap shot once every six or 12 months. The operator needs to address how checklists will be utilized (flow, challenge & response, electronic versus paper, etc.) and ensure aircrew train and operate to these standards. Check out our new IS-BAO Smart Operator Protocols in Excel format for operators to more effectively implement the standards and recommended practices. Buttons on the spreadsheet allow you to click to see the actual full text of the standard or recommended practice. A summary page is provided with graphs so you can brief your progress to the boss! The 2015 Smart Operator Protocols are available to download with the rest of the manuals. The 2016 version will be ready very soon. Check the IBAC website in about two weeks to download the 2016 version. The previous IS-BAO Newsletter introduced several initiatives that IBAC is pursuing to strengthen the integrity of the audit program. Many of these issues were discussed at the IBAC Governing Board last November and over the next few months IBAC will continue developing policy to support these improvements. More to come in the next newsletter. I am very excited to announce a new webinar-based learning program collectively called “IBAC Safety Net”. We intend to host periodic webinars on select topics ranging from key standards in the IS-BAO and/or IS-BAH, to methodologies in implementing the IS-BAO and/or IS-BAH, to key hazards that impact both flight and ground handling operations. Registration for each is $99 USD and the webinars will run for 1.5 – 2 hours. Additionally, a certificate will be issued for each webinar attended. Our first webinar is titled “Fatigue in Corporate Aviation: The Science of Fatigue, Operational Risk and Mitigation Strategies” and will be presented by Dr. Daniel Mollicone, CEO Pulsar Informatics. Please join us on 17 Feb. 2016 at 1600 UTC as Dr. Mollicone explains key Human Fatigue Principles, how to identify fatigue risk across your operation and typical procedures used to mitigate fatigue. If you have any questions, please contact Jason Starke (jstarke@ibac.org). 1. Regarding IS-BAO 3.2.3a (A1), “Has the organisation developed a series of safety performance indicators that are appropriate to the type of operation? “, which of the following is NOT a valid SPI? 2. Regarding IS-BAO 3.2.3(a) (A2), “Are safety indicators supported by measurable data that can be analysed for trends?”, which of the following is an example of appropriate measurable data? 3. Regarding IS-BAO 3.2.3(a), which of the following is an example of a low-consequence indicator? 4. Regarding IS-BAO 3.2.3(b), which changes should the organization have a formal process to manage? 5. Regarding IS-BAO 3.2.2 (b) (E1), which of the following could be a good example of training programs highlighting safety critical issues identified in the hazard risk analysis process?